TOKYO - May 12, 2017 - PRLog -- A&D, a multinational manufacturer of measuring instruments for laboratory and industrial use, has recently re-designed and upgraded its long-lived HV-G (multi-interval—lighter target objects yield finer readability) and HW-G (single range, high resolution) series of platform scales. The new HV-C & HW-C series (and the HV-CP & HW-CP series with printer built into the display unit), are not just tools for measuring weight, but rather provide a means for enhancing both the productivity and profitability of factories. Fast-paced weighing is an essential prerequisite for streamlining operations. With the HV-C/CP series of three multi-interval models (capacity × readability: 3/6/15 kg × 0.001/0.002/0.005 kg, 15/30/60 kg × 0.005/0.01/0.02 kg, and 60/150/220 kg × 0.02/0.05/0.1 kg), the measured value can stabilize in as quickly as 1 second or less. Even with the HW-C/CP series of four high-resolution models (capacity × readability: 10 kg × 0.001 kg, 60 kg × 0.005 kg, 100 kg × 0.01 kg, and 220 kg × 0.02 kg), stabilization takes not more than 1.5 seconds. To make packing and filling more accurate and efficient, the HV/W-C/CP series is equipped with bright, multi-colored 5-step LED comparator (traffic) lights that readily indicate whether the measured weight is within designated limits. Users respond to such signals with far less mental effort than looking at numbers. Comparisons can be made in either three levels (Low / Go / High), five levels (Low Low / Low / Go / High / High High), or even seven levels for grading applications (with no lights indicating either end of the continuum). The comparator light feature has now become a highly sought-after characteristic of A&D scales. 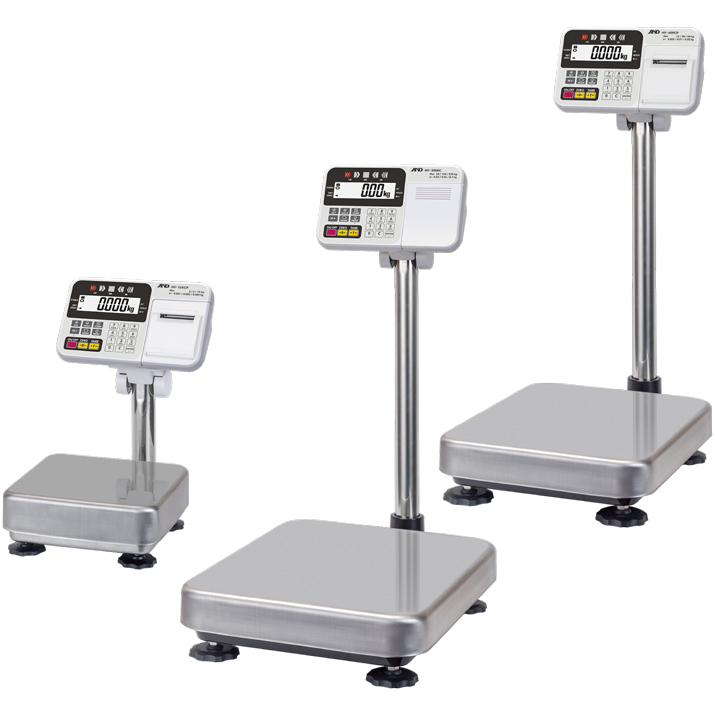 The HV/W-C/CP series can perform tare (offset the weight of the object on the scale and return the display to zero) automatically when the weight reaches the set target range. This function saves the operator from the hassle of pressing the TARE key each time for consecutive check weighings, such as when filling multiple cups with the same target quantity. Further, negative values can also be set as upper and lower limits of the comparator. When combined with the auto-tare function, the result is "take-away" check weighing that measures by repeatedly taking the target quantity out of a container without having to press any keys. The LCD display (25 mm character height) with clear white backlight provides excellent visibility, improves operator work efficiency, and reduces fatigue and errors—especially in areas with insufficient lighting. In addition, the display hold function makes it easy to read and record the display value when external disturbances such as vibrations occur unexpectedly. There is also an alphanumeric keypad on the display unit that allows simple and straightforward entering of preset tare values, comparator limits, calibration values and a variety of internal settings. Do-overs and correction of erroneous inputs are also made easy. Using the key lock function, a factory manager can inhibit the use of certain keys to prevent operators from making unwanted changes to the scale settings. Optional roller conveyers placed on the weighing pan can make measurement of heavy objects in production lines smoother and faster. Three slots are available for installing optional data communication interfaces. Users can output data, enter commands, and change the scale settings externally via the USB (for communication with a PC only) or RS-232C interface. Either two USB interfaces, two RS-232C interfaces, or one of each can be installed in addition to a comparator relay output/buzzer/contact input interface. The comparator relay output/buzzer/contact input interface signals check weighing results by buzzer and/or external traffic lights, and enables external key input (up to two commands). The display angle is adjustable to four levels to allow for more ergonomic use by individual operators. If necessary, the display unit can also be mounted high on a wall using the optional 5 m extension cable and wall-mount bracket. The IP65 dust & waterproof base unit can be washed with water and also allows for weighing of wet objects. The surface of the stainless steel (SUS430) weighing pan is resistant to chemicals, scratches and rust, and easy to keep clean and hygienic. A display cover is also provided as standard, protecting the display unit from unwanted dirt and splashing. The counting mode is useful for counting a number of small pieces of the same mass value instantly and precisely, while the accumulation (M+) function is useful for displaying the sum total of separate weighing results. Additional details can be found on the A&D website at http://www.aandd.jp/. A&D Company, Limited, headquartered in Tokyo, Japan, utilizes world-class analog and digital signal processing technologies to produce a wide array of laboratory and industrial measuring equipment solutions. A&D has consistently maintained its reputation as Japan's top manufacturer of electronic weighing instruments, ranging from ultrasensitive micro analytical balances to scales with several tons of capacity. A&D innovations are always designed to provide its customers with the highest utility and greatest value. For further information on A&D, please visit http://www.aandd.jp/.